I am making excellent progress on my stash of exotic fibers. 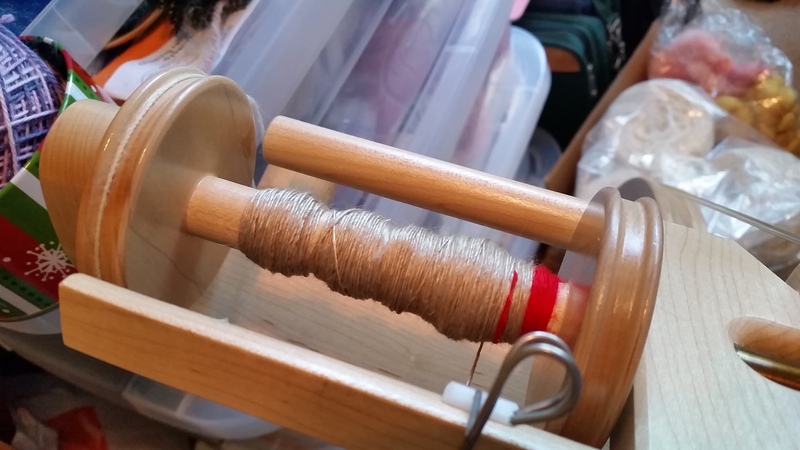 The camel/silk blend I spun today is the second-to-last variety I had left. I had sort of expected that it would be similar to the yak/silk blend I did a few weeks ago and I was correct. Neither one is a good choice for a beginner, but for the intermediate spinner it’s an excellent way to improve skills and the resulting yarn in both cases is really lovely. The undyed camel/silk fiber spins to a lustrous champagne color, with beautiful drape. The only exotic fiber left now is some Eri silk that I got in Phoenix last year when visiting family out there. This comes from cultivated silkworms that are fed castor leaves. The undyed fiber that I got is a lovely gold color. It will be interesting to see how it compares with Bombyx and Tussah silk in both the spinning process and the resulting yarn. I will be spinning this fiber next, to wrap up my “summer of exotics,” so I’ll have more to share soon. This entry was posted in Art, Fiber and tagged Camel/Silk Blend, Spinning. Bookmark the permalink.